Easy-Lok Cover Assembly- has thread assist mechanism to provide dependable sealing plus convenient access for adding tablets or sticks. Extra Large Chamber Capacity- to meet the needs of all sizes and types of pools. The corrosion proof, versatile design accommodates large or small slow-dissolving tablets or sticks. Dial Regulating Valve- is easy to use and lets you control and adjust the rate of feed for your pool’s variable requirements and chlorine demand. Feeder Tube- provides controlled outlet flow of highly concentrated chlorinated water plus serves as an auto air relief to expel entrapped air from the chlorine chamber. Versatility- for new or existing pools. 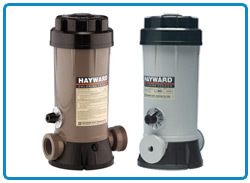 Choose either an in-line or off-line unit to suit your pool system. Want to enhances chemical treatment, naturally?